Easter flowers are a traditional decorative touch in many Christian homes. 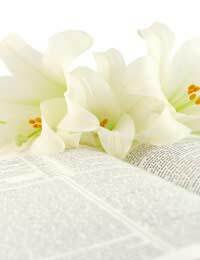 Easter, the day on which Christians celebrate Jesus' resurrection from the dead, is a day of joy and celebration and blossoming flowers are a wonderful way to be reminded of life and growth. Easter lilies are perhaps the most traditional flowers of this holiday, but local spring flowers, bouquets of wildflowers and the addition of traditional Easter items all make for lovely Easter arrangements as well. Easter lilies, also known as lilium longiflorum, are native to Japan but have been embraced around the world as a celebratory flower of Easter and have long been emblematic of Resurrection. They have irregular blooming periods, which mean that they are often forced to open in time for Easter. These graceful flowers have a long stem and elegant white petals, and can be arranged as part of a larger bouquet with other spring flowers, in large groups by themselves and even as single stems. Easter lilies are thought of as sophisticated flowers though, so the tone of any mixed bouquet in which they are included should be high enough for these lilies to still appear tasteful and refined. As Easter is a celebration of life and rebirth, local seasonal flowers make wonderful arrangements for this holiday. Though the date of Easter changes every year, it is accepted as a spring time holiday and as such arrangements of a variety of spring flowers are always appropriate. Tulips, crocus, lavender, daisies, hyacinth and azaleas are all seasonal flowers often found in Easter arrangements. In addition to providing wonderful bursts of colour, most of these flowers also have enticing scents that make them a joy to have around. However, an overpowering scent or an arrangement with clashing scents may irritate those who are sensitive or allergic to certain smells so mixing these flowers should be kept to a minimum depending on who will be around the arrangement. For a more rustic, natural look arrangements of wildflowers may be just the thing to truly celebrate the bounties of nature and the rebirth associated with spring. The flowers available for arrangements will depend upon the date of Easter and the location of those celebrating, but enlivening smaller arrangements with baby's breath, ribbons and bows are always options to make them more interesting or full. If these bouquets are to be given as gifts, then containing them in simple glass vases will help create a unified feel to the entire arrangement. In addition to flowers there are also other items that have come to be traditionally associated with Easter. Easter bonnets, the Easter bunny, brightly coloured Easter eggs, lambs, hot cross buns, candles and crosses are all cultural and religious symbols that are associated with this holiday. Adding small representations of these items to Easter arrangements can help make them festive and specific to the day. Usually though it's best to stick to either cultural items, such as bonnets, bunnies and eggs, or more religious items, such as lambs, candles and crosses. Mixing and matching items could create an arrangement that feels uncomfortable or could even be viewed as insulting. Easter is a religious holiday that has a long association with flowers. Easter lilies, spring flowers, wildflowers and miniature representations of traditional Easter items such as bunnies, eggs and more are all options for creating memorable Easter arrangements.